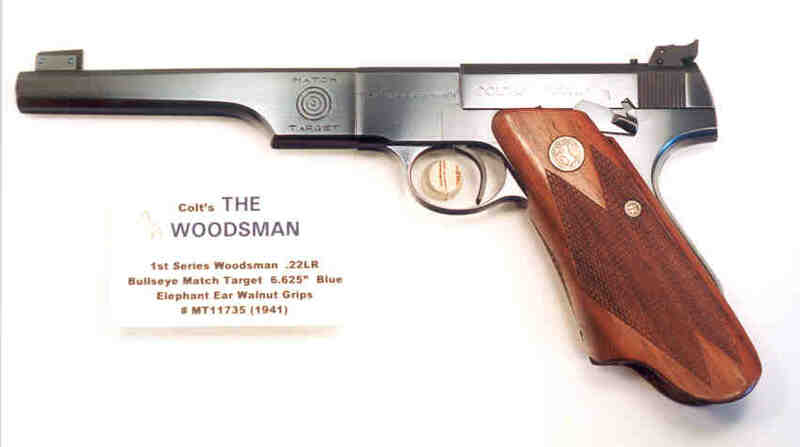 1st Series "Bullseye" Match Target .22LR 6.5" Blue, NIB, SN#MT11735 (1941) with perfect mint original "Elephant Ear" walnut grips (no cracks), correct original mainspring housing for high speed ammo, correct two-tone magazine with correct 3-line 'Match Target' imprint, mint bore, in above average intact and correct box with both internal platforms numbered to gun with end labels intact and correct test target numbered to the gun, mint instruction manual, bore brush in kraft cardboard sleeve, original hex-handled sight adjustment tool, and the wood shipping block inserted between the elephant 'ears' to prevent breakage. All markings correct. Gun is strikingly MINT!